Hi, everyone! I'm so happy to have visit me today. It's time for tag number 6 in the 12 Tags of Christmas Funkie Junkie style. Here it is. The idea behind the challenge is to be inspired by Linda's tag for the week. Well, my inspiration is the homespun feel of the tag and the layers. I also love that TH tree die, so I had to use that. 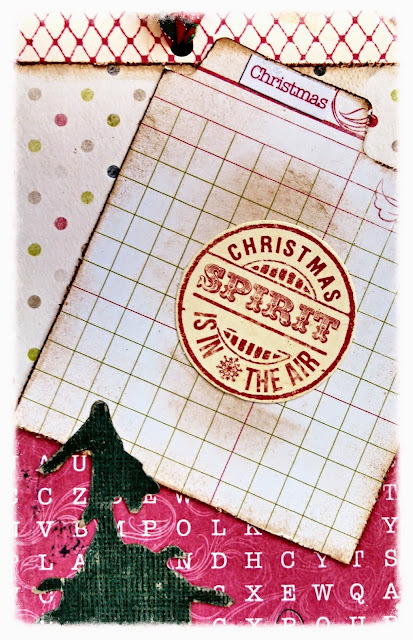 I used Authentique's Christmas collection papers for this tag. I love those papers because they all have the homespun old fashioned feel. I layered the different papers over a number 10 tag which I stamped with a Wendy Vecchi background stamp in Vermillion Archival ink and edged all of them with Vintage Photo DI. I used the tab on the edge die to cut one piece of paper so that the word Christmas is on the tab. I sponged it with Vintage Photo. I put an Authentique sticker in the middle. I used craftcore paper to die cut the tree and sanded it lightly. I added a card stock die cut with the Merry Christmas sentiment. And, that's tag number 6. Here are a couple of details. I'm caught up with the challenge. It's amazing but this week is tag number 10! I'll be posting my others so I can qualify for the challenge which is sponsored by the Funkie Junkie Boutique. There is still time for you to join in! Thank you all for visiting today. I love having you stop by the blog. Have a wonderful week! Gorgeous Maryanne! Love those Authentique papers and you have used them so well! Fabulous take on Linda's original! Loving the layers of lovliness here...especially the tree!!!!! Fantastic Maryanne! I love it!!! (and the other two I was just catching up on!) Hope your Thanksgiving is wonderful! Wow, this is the first X-mas tag where pink seems to be the perfect addition! LOVE IT! Your tag is gorgeous, Maryanne! I absolutely love it!!!! 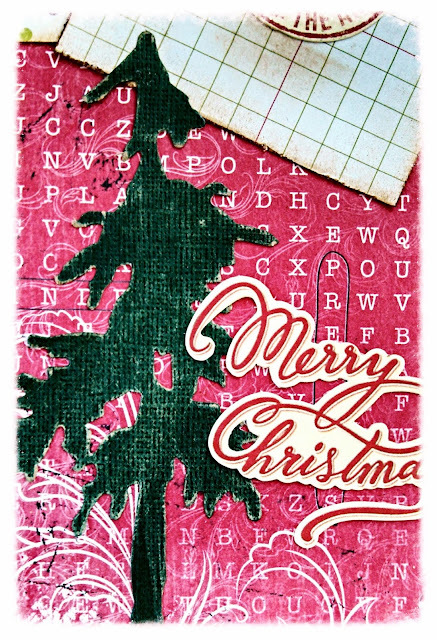 Love the traditional Christmas red and that file tab die cut is so cute! Terrific take on tag #6! Soglad ou ae still plying along!